Opens in 2 days 11 h 58 min. 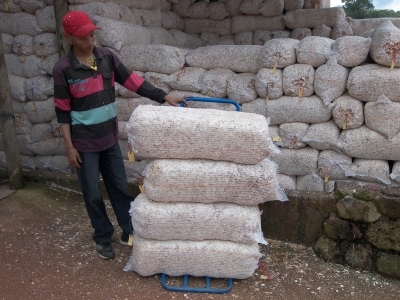 Producers of top quality eucalyptus wood shavings for the equine and poultry markets. Grandis Shavings, a company based in the Sabie / Nelspruit area, produce top quality purpose-made eucalyptus wood shavings for the equine and poultry markets. We only process eucalyptus timber through our mill, as research has shown that the use of eucalyptus as an animal bedding material, is far more benficial to the health of your animal than most other types of timber products used, including pine shavings and industrial sawdust. Eucalyptus has lower cytotoxic and enzyme-inducing properties than most other contact bedding materials currently being used in South Africa. In addition to this, it has a low dust content, generates little or no dust when activated by the animal's movement and has a higher moisture absorption rate, thereby reducing harmful ammonia levels. Furthermore, eucalyptus is a natural antiseptic as well as acting as a natural fly/insect repellant and decongestant. Comparative studies of contact animal bedding materials undertaken by the Animal Unit of the University of the Orange Free State confirm these statements. 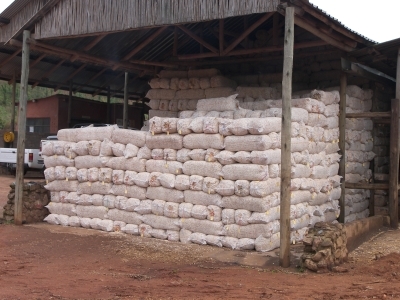 Our shavings are compressed into bags weighing an average of 15Kg(depending on the moisture content of the timber at the time of processing) This bag size facilitates easier storage, stacking, handling and transportation. If you require a quality product, conveniently packaged and that is beneficial to the health of your animals, give us a call right now !! Be the first to write a review for Grandis Shavings!